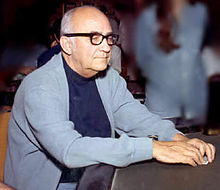 Johnny Moss at the 1974 World Series of Poker. Information accurate as of 30 January 2010. Johnny Moss (May 14, 1907 - December 16, 1995) was a gambler and professional poker player. He was the first winner of the World Series of Poker (WSOP) Main Event, at the time a cash game event in which he was awarded the title by the vote of his peers in 1970, He also twice won the current tournament format of the WSOP Main Event in 1971 and 1974. He was one of the charter inductees into the Poker Hall of Fame. Moss was born in Marshall, Texas in 1907 and grew up in Dallas, Texas, which was where he learned how to gamble as a young boy. A group of cheaters taught him how to cheat in games, but Moss put this knowledge to good use. As a teenager he was hired by a local saloon to watch over games and make sure they were played fairly. While he was keeping games safe from cheaters, he was also learning the strategy behind playing poker. Two years later he became a rounder, a player who travels the country looking for gambling action. In 1949, Moss played with Nick the Greek in a five-month-long "heads up" poker marathon set up by Benny Binion, winning between $2 and $4 million. At the conclusion of the game, Nick the Greek uttered what has become one of the most famous poker quotes ever: "Mr. Moss, I have to let you go." This game is often cited as the inspiration behind the WSOP. This game became the foundation for Al Alvarez's book The Biggest Game in Town and is one of the best known stories in poker. Despite being one of the best-known poker stories, a soon to be released book, Showgirl Stories, by Steve Fischer claims the game never took place. According to Fischer, there were no stories or reports of this tournament until six years after Nick's death. Binion never spoke of the game even when providing a detailed history of Las Vegas and avoided answering questions about the game by saying, "Well, my memory ain't what it used to be." While Nick the Greek was often covered by the national media, there are no news reports in any local or national source. Fischer says that nearly every version of the story is virtually identical to the version first told by Moss beginning circa 1971. The story is consistently said to have taken place in 1949 at the Horseshoe Casino, a casino that did not exist for another year and a half. Fischer also points out that during the time that Binion supposedly set up the game, he was fighting off a request from Texas to have him extradited. Because of his past, Binion lost his license to run a gambling establishment in 1948 and did not regain it until April 13, 1950. He was not granted a license to open the Horseshoe Casino until December 5, 1952. Fischer believes that the notion of Binion sponsoring a poker game, in front of a window, of a casino that hasn't opened, while fighting extradition is "absurd." 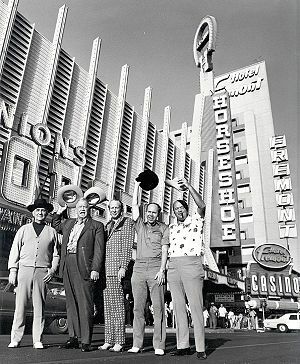 A group of players outside of Binion's Horseshoe in 1974. The players pictured are (from left to right) Johnny Moss, Chill Wills, Amarillo Slim, Jack Binion, and Puggy Pearson. Moss won the 1970, 1971, and 1974 World Series of Poker main events. For the 1970 WSOP, Moss was actually elected champion by his peers and received a silver cup as his prize. A (possibly apocryphal) story about that election which has appeared in print several times has every one of the eight players voting for himself as the best player, and that it was only when the players were asked to vote for the second best player that Moss emerged. He played at every WSOP from 1970 through the 1995 World Series, and during his career he won nine WSOP bracelets, placing him fifth overall, behind Johnny Chan, Doyle Brunson, and Phil Ivey (10 each), and Phil Hellmuth (14). During Moss' career he won $834,422 in WSOP tournament play. *In 1970, Moss was voted champion by his peers. **Moss set the, as of the start of the 2015 WSOP, still-standing record of oldest bracelet winner in WSOP history.